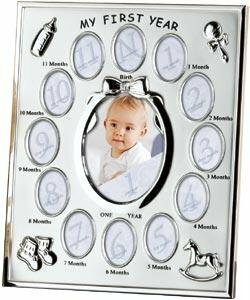 picture frames / photo frames: An adorable piece for any child's room Fashioned in beautiful polished silver plate this frame is perfect for showing off your baby's first year. At the center of the metallic mat display your child’s current 3"x5" portrait and surround it with first 12-month wallet size approximately 2'x3" photos. Overall the frame dimensions are 11“h x 9”w and .50”d. Glare resistant glass lens and velvet easel back for tabletop display. Produced expressly for SendAFrame by Prinz®.